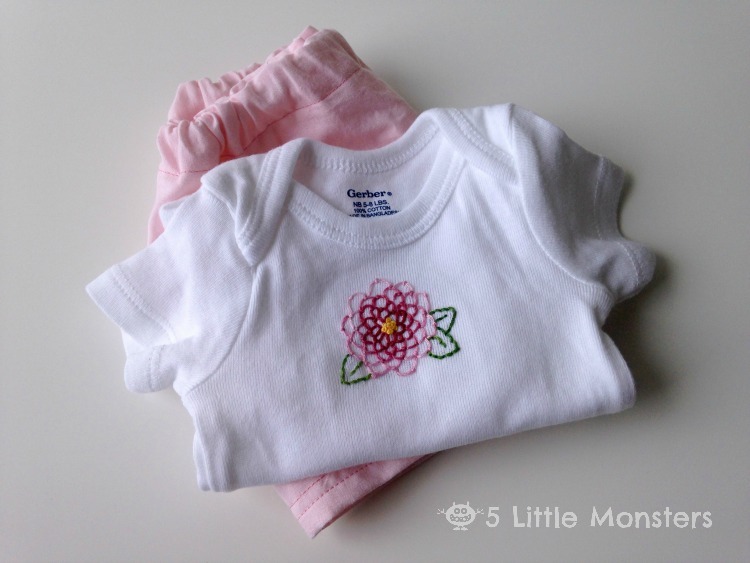 You could make a little set to give as a gift or add a little skirt or pair of pants to make an outfit. 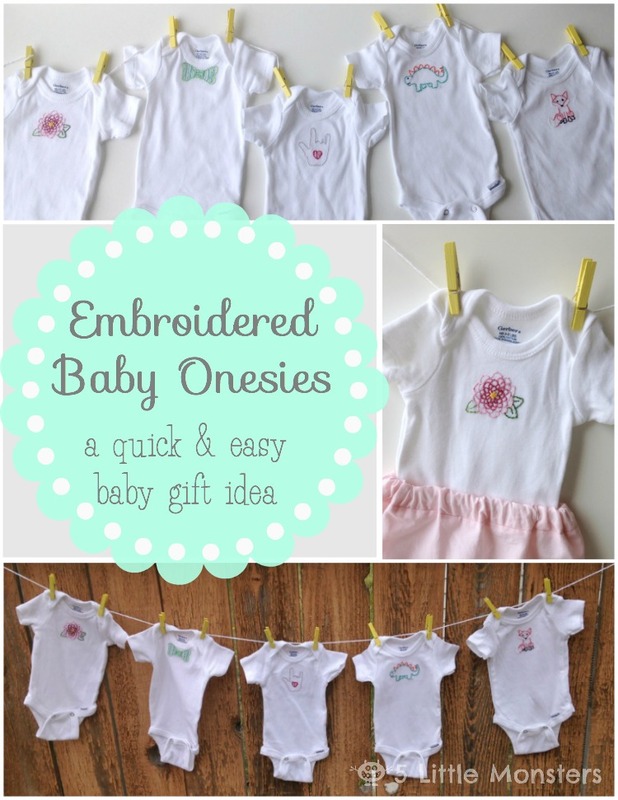 They would also be a cute, handmade addition to a store-bought gift, stick one in with a package of diapers and you have something really practical but also something handmade and unique. First, a bow tie for a little boy, I added some stripes just for fun. And another design for a boy, a dinosaur. 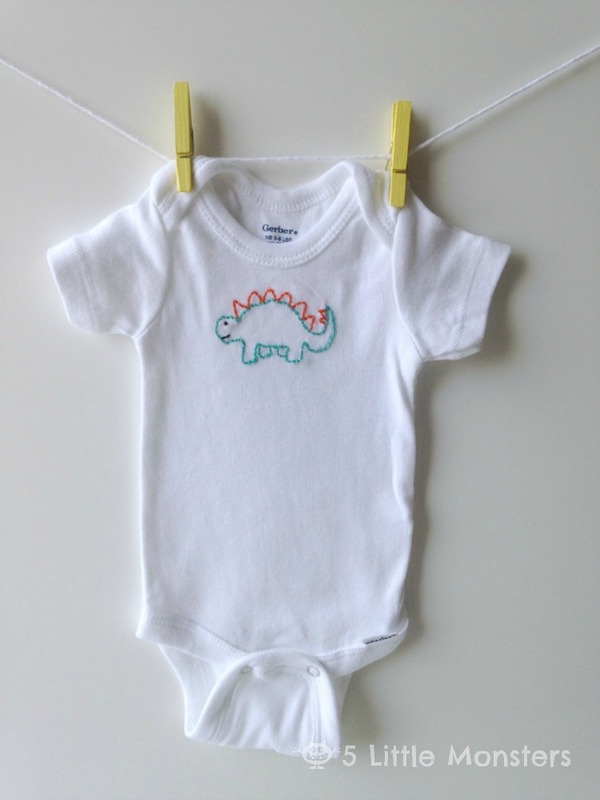 I loved dinosaurs as a kid and Stegosaurus was always my favorite so that is the one I had to go with. Next up I made a little fox. I think this one would be cute for a boy or a girl. For a more girly design I decided to make a flower. I used variegated thread to make it a little more interesting. The last design I made was this little ASL I love you hand. Since some of my kids are deaf and use ASL this is a frequently used sign in our house and is something that has special meaning for my family. Like so many of the things that I make, my kids were the inspiration for this design. 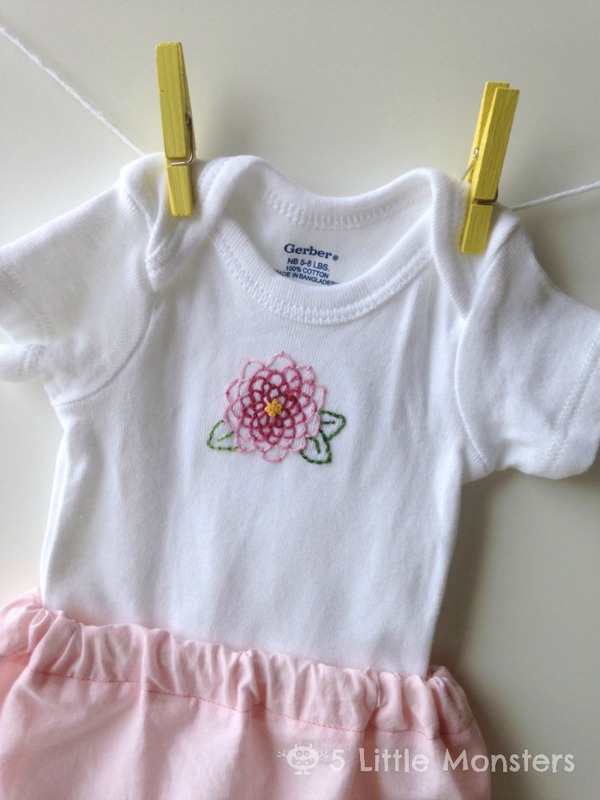 Embroidering on a onesie, or anything made of knit fabric, can be a little tricky. You want to be careful not to stretch the fabric but you also need to keep it tight. I tried a few different ideas to find the best way to do that and I am going to share the method that I found to be the easiest and work the best. Step 1: Cut a piece of the water soluble stabilizer a little bigger than the design that you want to embroider. Trace the design on the stabilizer leaving a little bit of a border on each side. 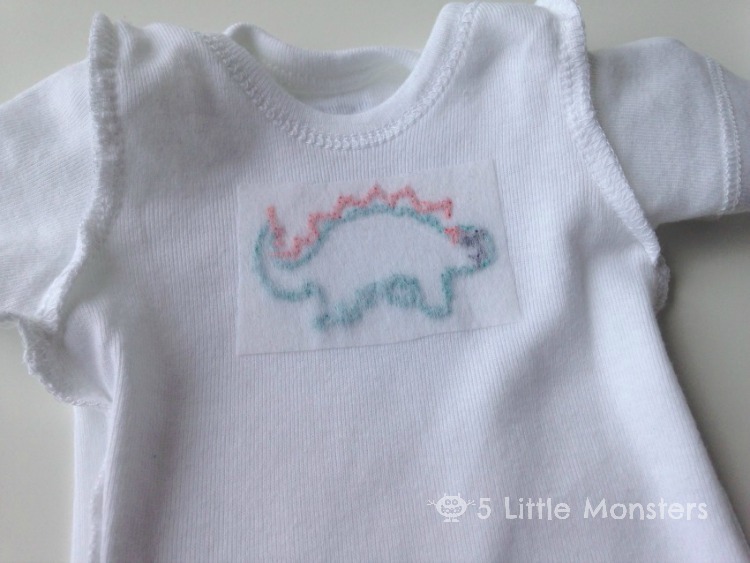 Step 2: Using regular sewing thread baste the stabilizer to the onesie where you want to embroider the design. Be careful not to stretch the onesie, just keep it flat. 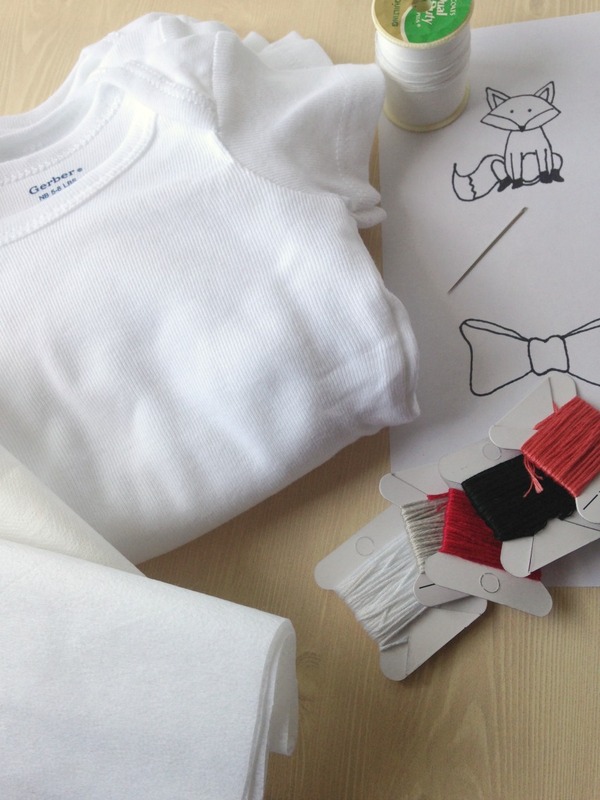 Step 3:Embroider your design. I mostly used backstitch for my designs, I used french knots for the eyes and the flower center and lazy daisy stitch to make the flower petals. I used 3 strands of floss for all of my stitching. Step 4: Trim around the edge to get rid of some of the extra stabilizer. Then rinse with water or wash in the washing machine to get rid of the rest of the stabilizer. Step 5: Turn inside out, cut a piece of interfacing big enough to cover the entire design. Iron on the back of the stitching to cover the knots and the stitching. 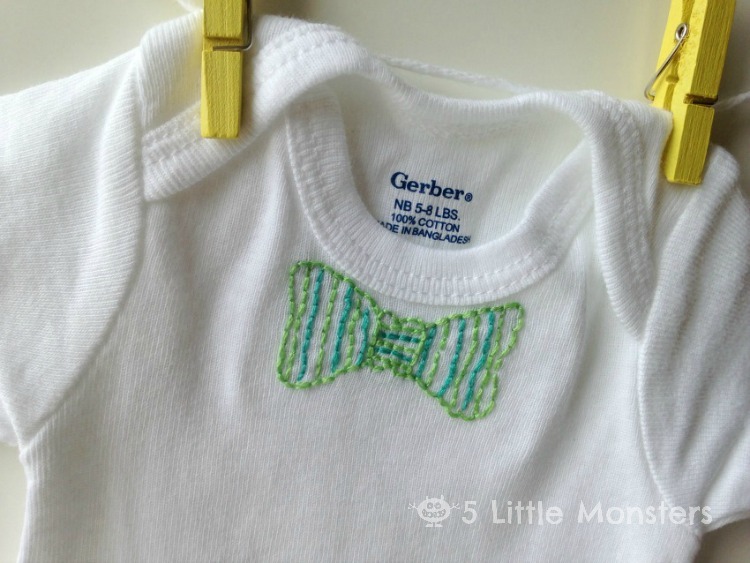 I did this to help keep it soft against a baby's skin, so that the stitching won't cause any irritation, especially any little knots. Turn it right side out again and you are done. The things that I like about this method are that, first, you don't need to use a hoop. 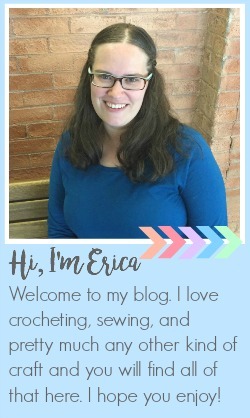 Trying to use a hoop on knit fabrics can be difficult because it can stretch the fabric. 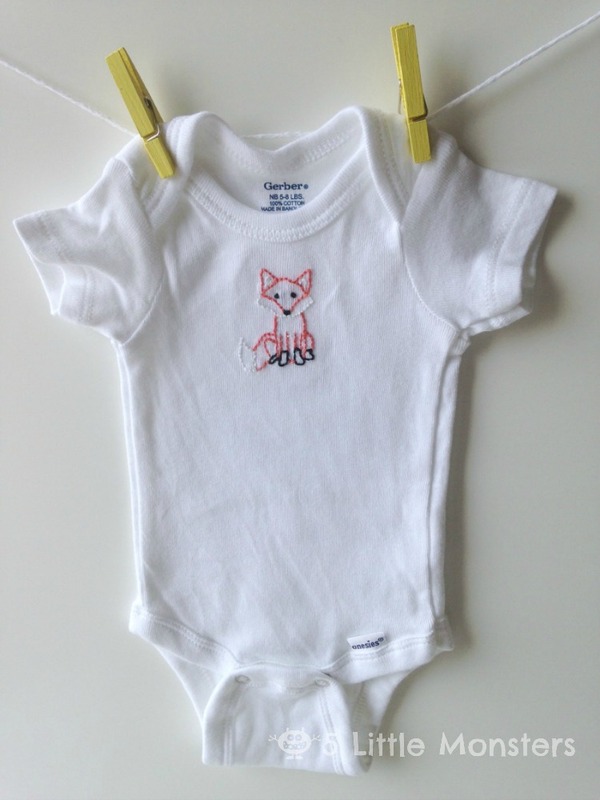 Second, you don't need to trace your design onto the onesie which is nice because it is hard to trace on knit fabric, it stretches as you try to write and it is think and hard to see through. This is the easiest way that I have found to do hand embroidery on knits, I hope it works for you too. 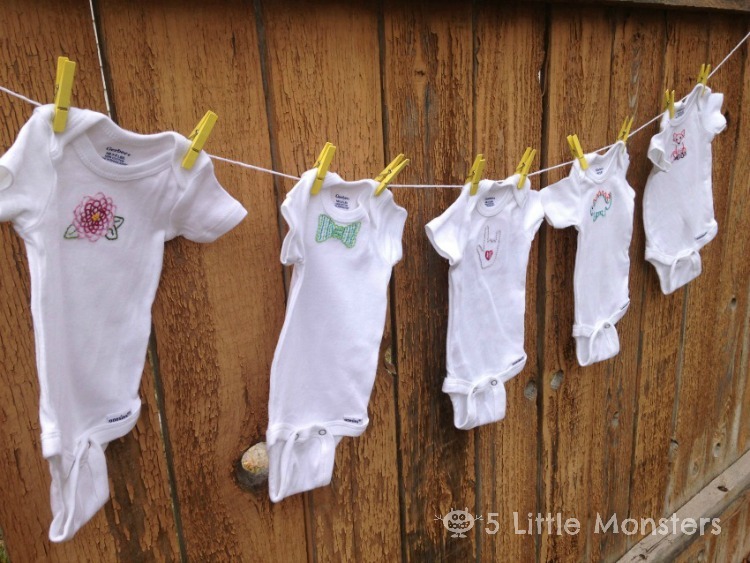 Have fun making lots of cute little baby gifts. Thanks for the GREAT tips! Never would've thought to use the interfacing on the TOP of the stitching in the back to prevent the irritation. You're a genius! Wonderful gifts! 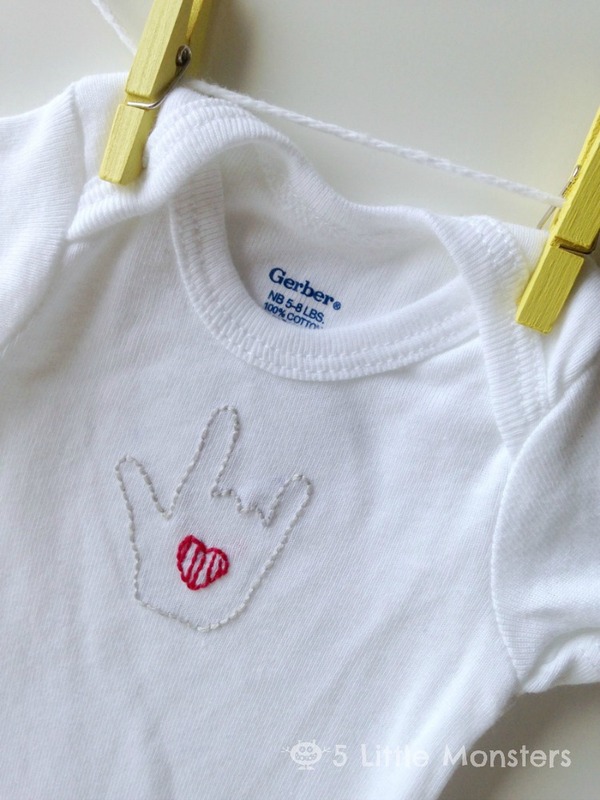 Especially in a baby shower programs we can get different types of attractive, unique and special baby gifts. But never before try any unique design of handmade baby fabrics. 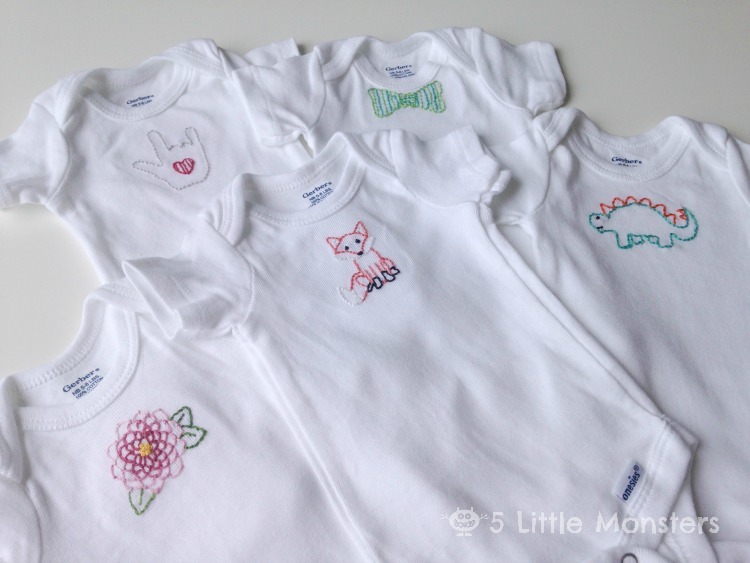 Here we can get some beautiful collections which are really attractive and unique for our babies and I hope while following the tips provided here we can prepare handmade stitching baby fabrics.